As I alluded to in my previous article, there are some crazy deals going on over at Twitch Prime right now (which is a part of Amazon Prime) that is giving away 21 games for free throughout July! And unlike PS+, you get to keep the games if your subscription expires, so nothing’s stopping you from getting a free one-month trial period, claiming all 21 (well, now 20, since Pillars of Eternity’s window has already expired) games, and then cancelling! And while there might be a few duds thrown in here and there, there also seem to be some genuinely great games included as well! So I decided to try each and every one out for exactly one hour, and then write my early impressions on them in exactly 200 words, so you know if they’re worth your time. Plus, with Pillars of Eternity being the unfortunate exception, each game I cover will be currently available to download for free on Twitch when the article goes live. This will be a seven-part series, each covering three games, being published every other day. Enjoy! This is an isometric RPG that very clearly attempts to replicate the feeling of a traditional D&D campaign. From my limited experience with both D&D and this game, it seems to do so quite well. After creating a character with what might as well be a character sheet, you start out in a caravan. I won’t spoil the beginning, but it takes multiple tragic turns right from the start, and introduces many mystical elements. Cutscenes are often a series of illustrations and written or spoken dialogue, but it’s all done so well that I actually preferred it. The isometric perspective and art style is an acquired taste, but it grew on me very quickly. The music is quiet and serene, which really sells the lonely tone the game’s going for. Gameplay is initially simplistic, requiring nothing more than clicking the enemy. I however have no doubt that it will be fleshed out as the game progresses, as there were multiple mechanics introduced to me every few minutes via tutorial. The game’s not really my speed (it’s about 40 hours long! ), but I can’t deny it as a quality title for anyone looking for that authentic D&D experience. Pillars of Eternity: Definitive Edition is unfortunately no longer available for free on Twitch Games, but you can buy it on Steam for $40, and the standard version (no DLC) for $18. Sorry, guys. 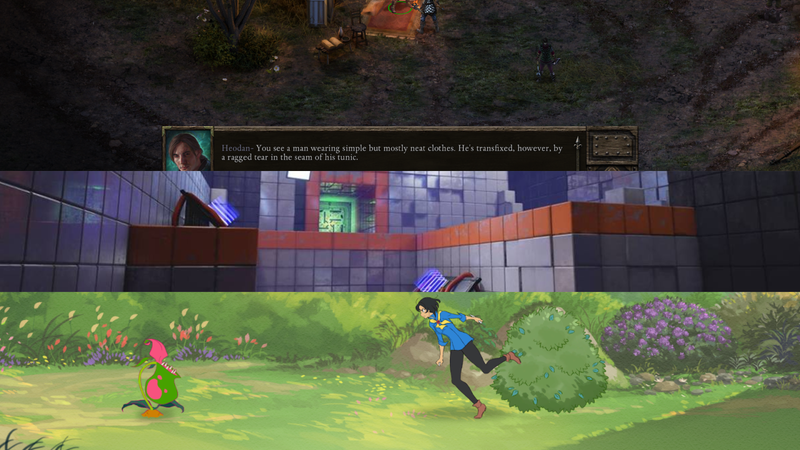 But, the good news is that Tyranny, made the year after Pillars of Eternity by the same developers, is free on Twitch Prime on July 16 and 17, so make sure to pick that up if this game interests you! This game wears its inspiration from Portal on its sleeve. And while it doesn’t quite live up to Portal’s high standards, it hits the mark pretty well, while still introducing plenty of new ideas of its own. While a lot is unclear at the start, (very possibly because I haven’t played the predecessor) I was caught off-guard by one unsettling scene. It quickly passed, however, and most dialogue occurs between two British women, one being the protagonist. All I knew was that I needed to keep going up this tower to prevent something bad from happening. It’s well-delivered and kept to a minimum, but lacks any of the charm of Portal’s GLaDOS. The music has some quiet tension, but it’s still contemplative enough to be conducive for puzzle-solving. Puzzles involve aiming at white squares carefully placed throughout each level to create momentum, a platform, or a cube. These mechanics work effortlessly together, with everything you need to solve each puzzle right in front of you. They aren’t too difficult from the beginning, but the final puzzle I took me ten minutes to figure out. I felt very clever once I did, and that’s the sign of a good puzzle game. Q.U.B.E. 2 is available for free through Twitch Prime Games through July 9th. It’s a puzzle game like Puyo Puyo, and it’s a fighting game, and it’s all set in a medieval tournament in a delightfully cartoonish style. It sounds like those ideas wouldn’t mesh together well, but everything here is executed so flawlessly that I never questioned it while playing. You play as Mina, who is trying to win the “Battle Chef Tournament,” in which contestants hunt monsters in a medium-sized side-scrolling area, come back to the kitchen to put those ingredients together into a dish tailored for the specific judge, and repeat until the time limit is up, by which point the dish must be delivered to the judge. And while it’s exhilarating during matches, other parts of the game let you enjoy the rich world you inhabit. There are side-quests for you to focus on the puzzle, battle, or matching mechanics in a vacuum. Every character is instantly endearing through their animation, writing, and voice acting, and the lavishly colorful and detailed world with cheery music ties it all together. This is a game that elicited audible responses, whether it be my laughter at the game’s hilarious dialogue, or my cheers as a judge just barely claimed me the victor. Battle Chef Brigade is available for free through Twitch Prime Games through July 10th. So far, each game has been better than the last. We’ll see if that continues when I review the SNK bundle (Metal Slug 3, The Last Blade, and Twinkle Star Sprites) this Sunday! Remember, Q.U.B.E. 2, the SNK bundle, Battle Chef Brigade, Manual Samuel, and GoNNER are all available for free today. Hey, I just realized that ThePickyGamer and Twitch Prime Games have the same initials! Maybe I should rename it “TPG reviews TPG.” But that would be confusing, so I won’t! P.S. Holy crap guys, we’ve collectively written 300 articles for SixTAY Days of Writing! Keep it up!